Sonex Aircraft announced at a press and customer briefing this morning that orders are now being accepted for the long-anticipated AeroVee Turbo, with deliveries to commence in the fourth quarter of 2014. The AeroVee Turbo is rated as a 100 horsepower engine at sea level, and yields significant performance enhancement to the Sonex line of aircraft without breaking the bank. Price of the AeroVee Turbo is $10,995, and an AeroVee Turbo Upgrade package is being made available for installation with existing AeroVee Engines, even those already installed and flying, at a price of $3,995. Two Sensenich fixed-pitch propeller options are being offered for AeroVee Turbo installations on Sonex Aircraft. A 54″ diameter x 50″ pitch prop is intended for those wishing to maximize climb performance while still retaining a very-respectable 170 mph TAS cruise capability at 8,000′. A 56″ diameter x 52″ pitch prop will maximize top-end speeds, measured as-high as 187 mph TAS using WOT at 8,000′ (38 in HG MAP) during Sonex/AeroVee Turbo flight test. Designed with simplicity in-mind, the AeroVee Turbo is intended for use with fixed pitch, or ground-adjustable propellers, keeping the package Sport Pilot Eligible by not requiring a constant-speed propeller, and with sea level cruise just under the Sport Pilot maximum speed at 135mph TAS at the Max. Continuous RPM specification for the AeroVee Turbo under 5,000′ MSL, 3200 RPM. The AeroVee Turbo is a pull-through turbo arrangement utilizing the standard AeroVee-sized 32mm AeroInjector. As a “free-floating” system, boost is controlled only by throttle setting limited by a fixed waste gate and power still diminishes with gains in altitude, but losses are not nearly as-drastic as those with a normally-aspirated engine. 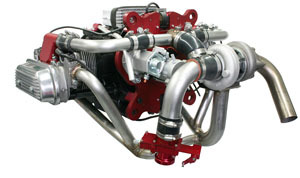 This allows the cruise speed of an AeroVee Turbo in a Sonex Aircraft at-altitude to eclipse the performance of the 120hp Jabiru 3300 engine. A full-lengh YouTube video, Sonex AeroVee Turbo Video Tour with Jeremy Monnett, has been released this morning illustrating the Turbo’s performance in a Sonex.